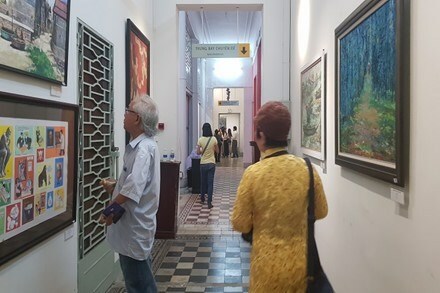 HCM City (VNA) – As many as 122 paintings and sculptures are featured at the region’s largest exhibition at the Ho Chi Minh City Fine Arts Museum in District 1. The exhibits include a variety of traditional and contemporary works created by 123 young and veteran artists from Mekong Delta cities and provinces. The works are the result of a latest collection selected by a jury of the Vietnam Fine Arts Association and HCM City Fine Arts Association, the event’s organisers. Most paintings are in acrylic, silk and lacquer while sculptures are in composite, wood and mixed media. "The exhibition features different tastes of contemporary southern Vietnam through the artists’ new vigour and passion,” said Tran Khanh Chuong, Chairman of the Vietnam Fine Arts Association. “Through our showcase, we hope to encourage young artists to develop their career and help young people learn more about the art as well,” he added. According to Khanh, the government plan to provide some financial support to literature and fine arts associations. The organisers have presented 2017 Fine Arts Awards to 11 works. No first prize was awarded this year. Hoang Tuong Minh took home the Fine Arts Award’s s second prize for his steel sculpture Khong Gioi Han (Unlimited). His work shared the prize with Doi Thoai (Dialog), an oil painting by Nguyen Huu Duc, and Ruong Bap O Moc Bai (Corn fields in Moc Bai), a canvas by Lam Tri Trung. All of the prize-winning works feature southern people’s everyday life and work. The show also includes works by young sculptors and painters such as Nguyen Thi To Uyen and Ho Minh Quan.